I am not a morning person, so I definitely need caffeine of some kind in the morning. (You don’t want to see me before having caffeine – boy I am a grump.) 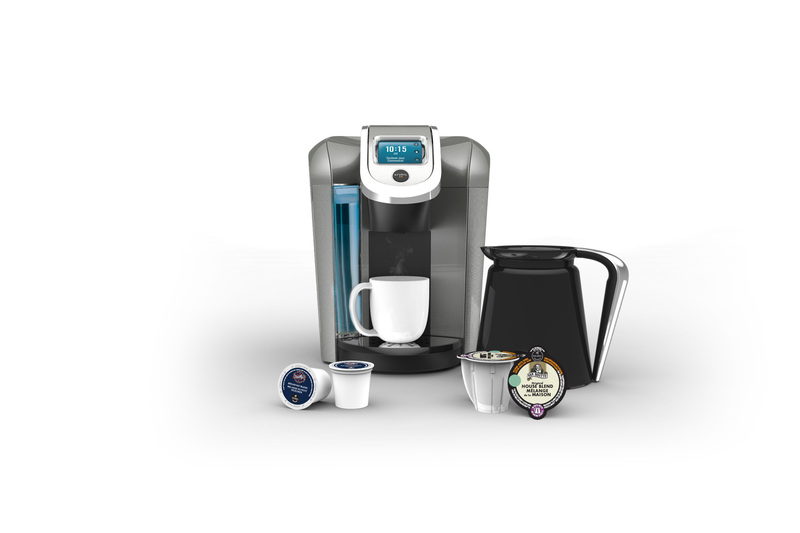 I was happy to receive the Keurig 2.0 K400 model to use and review. I have been using the K400 at work for about one month now. We are a small team of 4 people in my department but often have outside visitors for meetings. The K400 is a perfect solution for us in the office. The Keurig 2.0 has a nice sleek and functional design. The K400 has a color touchscreen which provides easy coffee controls. The menu options are intuitive and I did not need to read the manual to figure it out (although it is recommended that you do.) I like the automatic shut off feature which means the Keurig is not left on accidentally over the weekend. You can also change the menu’s color scheme, along with the color of the LED which lights up the water reservoir. It is very user friendly. Turn it on, water for the water to pre-heat, pop in a K-Cup, select the size mug, and press the big ‘Keurig 2.0’ button. All of this takes about a minute to brew. With the new scanner, the K400 automatically knows if I am brewing a single serve cup or if I am using the K-Carafe Pack to brew an entire pot. As I briefly mentioned in the cons above, I do not have a cup size selection big enough for the mug that I use. My mug is 12oz and the largest option provided on the K400 is 10 oz. I have figured out a way to bypass this though. I first set the size selection to 8oz and once it is finished and it asks me to insert a K-Cup, I just open and close it right away and reuse the K-Cup that I had for 8oz and select 4oz. So essentially I am using the same K-Cup twice to brew 1 cup of coffee or tea. I find that it doesn’t affect the quality or taste and I am able to use my bigger mug. Win-win. In addition to the scanner, the K400 also uses a slot at the base of the machine to help figure out what you are trying to brew. There is the normal drip tray that you sit your mug on top of which slides into place using a specific tab. To make a full pot, you just pull out the tray and replace it with the K400’s proprietary carafe, which has its own unique tab. This is a smart, subtle design touch, which means that the K400 won’t brew an entire pot’s worth of coffee unless it senses there’s actually a pot in place to catch all of it. In the office, it has being providing all of us with more choice and allowing us all the ability to brew our own coffees and teas everyday. (I personally don’t like regular coffee and prefer flavored ones so I am very pleased with the selection of flavored coffees that there are.) We have used the K-Carafe for meetings and find is quick and useful. We have tried a variety of coffees and teas and we all agree that the taste and quality of our beverages are very good. We have all been satisfied with the performance of the K400. The K-Carafe packs are recyclable. When you’re finished, just peel the foil lid off, pulling the filter out with it — the #5 plastic housing left behind can be recycled in most areas. The K-Cups use a type of plastic that can’t be recycled anywhere. The Keurig 2.0 K400 brewer has been a hit in the office and has saved us money from doing Starbucks or other coffee runs everyday. Have you tried out the new Keurig 2.0? Would love your thoughts and opinions below. I received a K400 brewing system from Keurig for this review. Good or bad, my reviews are honest with my readers best interest in mind.